UPDATE: As of August 2018, I no longer work directly with the Vivint Gives Back program. The specific program that I was working with was terminated but there are absolutely no hard feelings about anything. This is an amazing program and the people involved in the Vivint Gives Back program are awesome. I still use Vivint in my home via the Vivint Gives Back program and I would recommend it to anyone, especially special needs families. 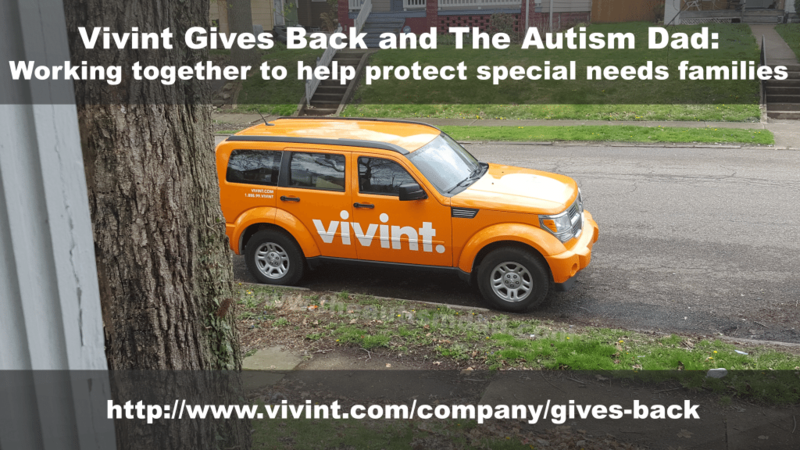 The Autism Dad and Vivint Gives Back are working together to help provide Special Needs Families with desperately needed peace of mind, safety and security. We are providing that peace of mind via Vivint’s Smart Home Security system, geared at helping parents keep their Special Needs children in the house while keeping the bad guys out. As a father to 3 boys on the Autism Spectrum, I know first-hand the challenges that many families like mine face, every single day and night. I have also experienced first hand how Vivint Gives Back works with families like mine. When I was first approached about this project, I was very skeptical because I’ve had security systems before from other companies and the monitoring service was sold several times, and my service fees grew each time. They grew to the point I could no longer afford the service. That doesn’t happen with Vivint Gives Back. Your monthly rate is based on your income. My entire home is now secured with Vivint for only $15/month. That’s what my income qualified me for. I was able to receive the service free of charge as part of being their Brand Ambassador, but I made the decision to go through the same process any other family would and pay for the service, based on my income, just like anyone else would. I did this because I truly believe in this project and will not endorse something that I’m not willing to pay for myself. I’ve been so excited to share this with my readers and the Autism community at large. The time has finally arrived to break my silence and explain about this project I’ve been working on for the past few weeks. Rob Gorski and The Autism Dad blog are an official Brand Ambassador for Vivint Gives Back. I was provided with equipment for review purposes and so that I can answer any questions anyone may have about how the products function. I DO NOT receive the monthly service for free. I pay what my financial situation qualifies me for, just like anyone else who seeks to take advantage of this program. 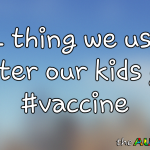 This is import to me because as a leader in the Autism community, I will not endorse something that I don’t believe in and what better way to show that I believe in something like this, than to pay for the service, like anyone else. This IS NOT a paid endorsement. I was approached a couple of months ago by a company named Vivint. I’ll admit that I’d never heard of them and frankly, I get hundreds of solicitations a week. After a few more emails back and forth, we finally connected and I learned exactly what it is that they were doing. 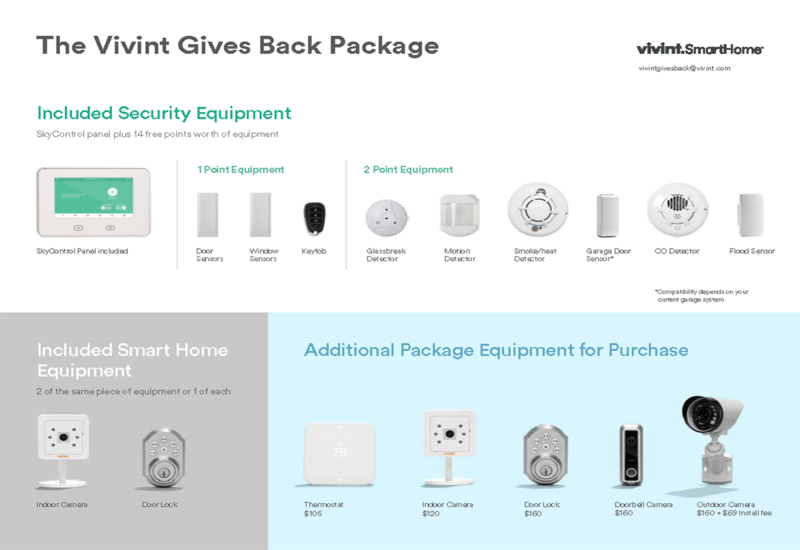 Vivint Gives Back is a program where Vivint provides in home security to special needs families at a significantly reduced rate. Monthly service fees are based on a sliding scale and range between $15 – $40 per month, depending on families income and the equipment package is no cost. Below is a list of the items you get to choose from. You can always purchase more at a discounted rate. 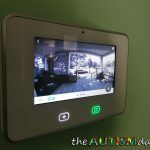 What makes Vivint different is that they build these systems around keeping people in the house, like wandering kids with Autism. Of course, the system alerts you and the police to intruders as well, but the idea is to provide parents with peace of mind by helping them monitor their child’s whereabouts while in the house. Everything is controlled by a central panel and linked to your smartphone or tablet, allowing you to manage your home security from any Android or iOS device with an Internet connection, via the Vivint app. 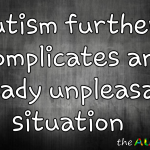 That’s the basic rundown, and now it’s time to share how I’ve implemented this system, to improve the safety and security of my three kids with Autism. Please keep in mind that I have extra equipment installed in my home as part of being the Brand Ambassador. Also, understand that I can only disclose so much information about my security setup because of privacy and security reasons. In my house, I have every exterior door monitored, meaning when a door opens, a doorbell rings. The identity of the door is announced through the central panel, and my phone receives the alert providing the same information. I also have sensors on all the first-floor windows as well. When a window opens, the same thing happens as above with the doors. A wireless indoor camera is used to help me keep an eye on my kids, from my phone or tablet. 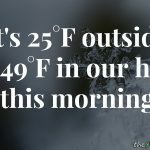 You can see an example of that use when scrolling through the pictures above. When my kids had the stomach flu this past week, I was able to move the camera into their bedroom and monitor how they were doing from my couch. My setup also includes a motion/glass break/CO/Smoke/Fire/Flood sensors as well as door locks, a doorbell camera, and wireless thermostat. 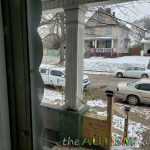 If you follow my blog, you probably already know that we live in a really bad neighborhood and the doorbell camera provides a live audio/video feed from the entire front of my house. Just last night I had someone ring my doorbell at 11:30 pm and I was able to not only see who it was but also speak to them without answering the door or them even seeing me. Both cameras have night vision, but only the doorbell camera has audio. I almost forgot. I did receive an appliance module which allows you to power on/off lamps or something similar, via your phone, really tablet or central panel. The app itself works extremely well and has some cool features. 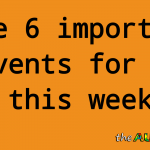 My favorite feature is the ability to set automatic actions, at designated times or because of a designated action. For example, I can set all doors to unlock when the smoke detector goes off. I can have the house arm or disarm itself automatically, based on time or actions. It’s very similar to the IF app. 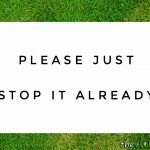 While historically speaking, my kids don’t tend to wander, it has happened before, and my youngest has been displaying concerning behavior as of late. The bottom line here is that no one can get into or out of my house without me immediately being notified. If you’re a parent, who can’t sleep for fear their child will wander the house or worse, leave the house in the middle of the night. Vivint can help you keep your child safe and provide you with peace of mind. I’ve been using this system for about a month or so now, and I couldn’t be happier. I’ve been impressed with the entire process, and I have gone through the same process you will. The installation was quick, and the installer even answered endless questions from my youngest. 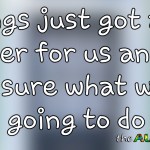 They didn’t leave a mess, and when a problem arose, customer service sorted it out immediately. It’s not reasonable to expect perfection from technology, but I do have high exceptions for how those problems are addressed. As I would have absolutely no problems recommending Vivint to my family, I can without hesitation, recommend this program to all of you. What Vivint Gives Back has done is provide parents like myself, with peace of mind that I couldn’t otherwise afford. Please feel free to ask me any questions you might have, and I will answer them as honestly as I possibly can. If you’re interested in this program, click Here to apply and see if you qualify.